When you hear a group of young children reading poetry together, you can clearly see their delight in the rhythm, rhyme, and patterns. To these children, reading poetry together is a fun activity! The shared reading of poetry from an enlarged, illustrated chart makes it possible for children to "read" a much more complex text than they could independently. As they share the text with your support, they become immersed in the magic of words. 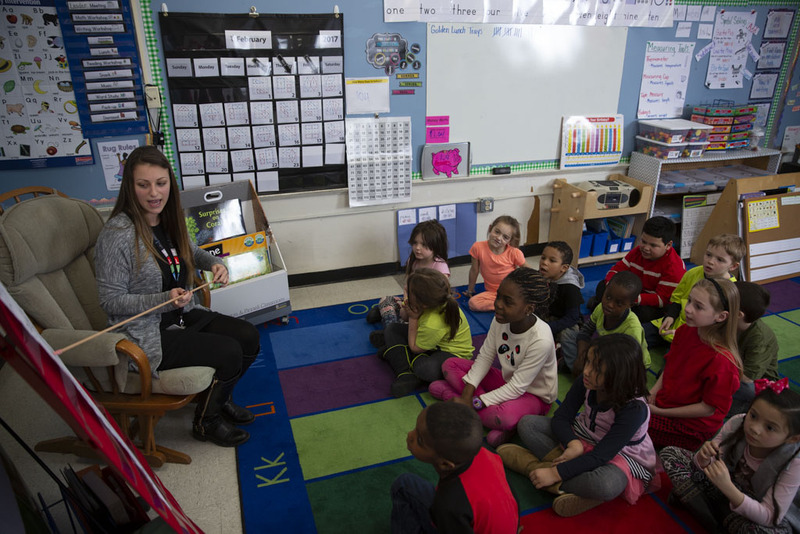 Shared reading of poetry helps children become aware of the phonological system of language, which is basic to providing a foundation for matching sounds with letters, letter clusters, and word parts. The more children play with language, respond to it, and notice it, the easier it will be to map all the concepts related to reading and writing. As children respond to the sound patterns, intriguing words, and inspiring ideas they find in poems, songs, and rhymes, they are learning invaluable lessons about the ways in which our language works – knowledge that will serve them well as they become readers and writers. Marching to rhymes – Marching around the room while chanting a poem will help children feel the rhythm. Puppet show – Have children make stick, finger, or sock puppets of their favorite poetry characters and act out the poem as their friends read it. Alternatively, have the puppet say the poem. Listening for rhymes – Have children clap or snap their fingers when they come to a rhyming word. They can also say the rhyming word softer, louder, or mouth the word without making a sound. Mystery words – In shared reading of a familiar poem, leave out key words but show the first letter so that children can check their reading. You can also use sticky notes and then uncover the word to check it. Personal poetry books – Have children make their own personal poetry books by gluing the poems they experienced in shared reading into spiral notebooks and then illustrating them. Over time they will have a large personal collection of poems to take home. Find other ways to engage children while exploring poetry with Words That Sing: Poetry Charts for Shared Reading, an illustrated collection containing a rich resource of poems, songs, and rhymes. It will fill children with language, ideas, and imagery that will help them use and enjoy the oral and written word. The charts, available for grades PreK-2, can be used to as a stand-alone resource or alongside the Fountas & Pinnell Classroom™ Shared Reading Collection and Fountas & Pinnell Phonics, Spelling, and Word Study System. To celebrate National Poetry Month, Heinemann is offering 40% off the list price of Words That Sing with promo code POEM19 when you order from heinemann.com. * Click below to order now!